Accessories – Education Boards | 2×3 S.A.
Made with thick, resistant to bending PCV, including magnetic hangers ensuring easy fasten to the board surface. Set including: magnetic setsquare 60°, magnetic setsquare 45°, magnetic protraktor, magnetic line 100 cm, compass with silicon hangers. Ergonomic shape. Large wiping surface. For dry cleaning. White or coloured, rounded chalk. Environmental friendly. Diameter 10 mm. 5 pcs in box. 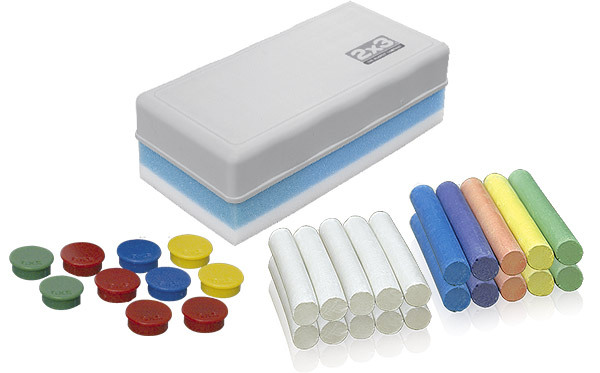 Includes: wiper for chalk, magnets (10 pcs), 2 sets of chalk (white and coloured – 10 pcs).